Precise cosmological measurements coupled with astronomical evidence has allowed us to piece together a model of the Universe that explains much of what we observe. This model is known as the ΛCDM model and tells us that we live in an inflationary universe that is made up of contributions from 'Dark Energy' (68%), responsible for the accelerating expansion of the Universe, baryonic 'normal' matter (5%), and a 'Dark Matter' component, which makes up the remaining 27%. However, the nature of the dark elements remains unknown and consequently, fundamental questions still cloud the model. From both astrophysical and particle physics considerations, stable and heavy Weakly Interacting Massive Particle (WIMP) candidates that arise naturally from extensions to the Standard Model of particle physics are particularly compelling. The ΛCDM model is built combining a wide range of astronomical and cosmological data that includes mapping fluctuations in the Cosmic Microwave Background, surveys of galaxy clusters, and measurements of distant supernovae. The best fit to this data suggests most of the Universe is "dark" - in the form of 'Dark energy' that causes the rate of expansion of the Universe to accelerate, and 'Dark Matter' accounting for 85% of all matter. Although Dark Matter cannot be seen directly, its gravitational influence is obvious. The arcs and rings seen in images of galaxies are formed by light emitted by these distant sources being bent due to the gravity from an invisible body of Dark Matter between us and the galaxies. 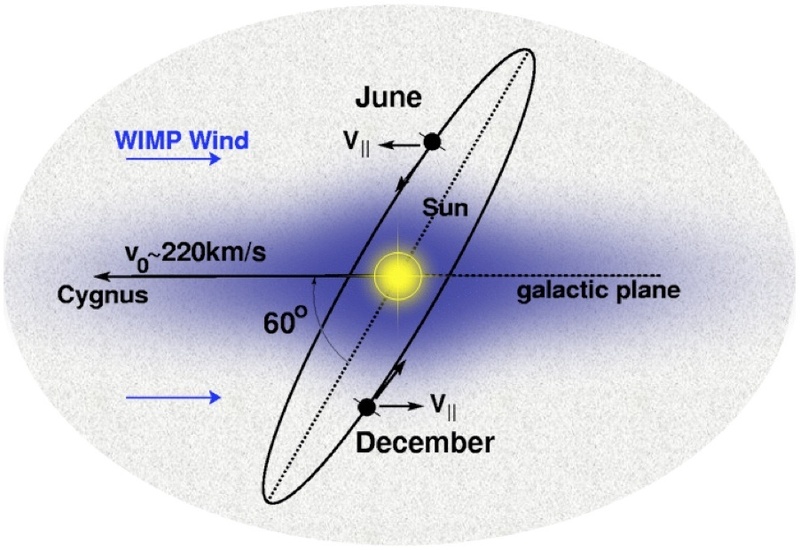 WIMPs, interacting with regular matter only very rarely, would satisfy the requisite abundance today, be stable on the timescales of the Universe, and would have been non-relativistic at the time of decoupling - providing the gravitational seeds for large scale structure formation. Its presence today acts as the glue holding galaxies such as our own together. Confirmation of the WIMP hypothesis would cast light not only on Beyond Standard Model physics and extrapolation to GUT scales, but would considerably advance our understanding of the matter composition and evolution of the Universe. For these reasons, the discovery of Dark Matter has been identified as among the most important scientific missions of the 21st century. Three avenues are presently pursued with the aim to identify Dark Matter: indirect, accelerator, and direct searches. Indirect methods deploy space-based and terrestrial instruments to search for signals from decay products following WIMP annihilations in regions of high density. Accelerator searches such as at the LHC seek to achieve sufficient collision energies to be able to produce WIMPs and observe missing reconstructed energy in the final states to infer their mass. However, neither of these techniques is by itself capable of providing a robust statement on the nature of Dark Matter. Expected annihilation signatures from indirect searches are easily mimicked by standard sources, and accelerator searches cannot address stability of the inferred particles and conclude that they represent galactic WIMPs. Instead, it is direct observation of WIMPs within our own Milky Way that is recognised as the definitive channel for detection. Internationally, meeting this challenge and detecting galactic WIMPs is recognised as one of the highest priorities in science, featuring often above all else in roadmaps and research recommendations worldwide. Galactic rotation curves suggest the Dark Matter forms an extended halo around galaxies such that our solar system, moving through this halo, is exposed to an apparent flux of WIMPs. These WIMPs may be directly detected by recording the energy deposition made by a recoiling nucleus following a WIMP scatter. However, given the kinematics, the recoil would generate energies of only a few keV. Moreover, the event rate is dictated by the coupling of a Dark Matter particle through the Weak force, resulting in extremely rare signals. Experiments must, therefore, operate detectors with very low thresholds, very low intrinsic and external radiological background, located in deep underground sites shielded from cosmic rays. Despite these challenges, several technologies have been developed and deployed successfully over the past 30 years in attempts to be the first to discover WIMPs. Where no signal has been detected, constraints on the WIMP-nucleon interaction cross-section have been derived. As yet, no unambiguous discovery of Dark Matter has been made. 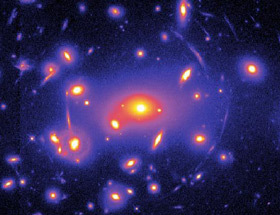 Dark Matter is thought to exist as an extended halo encompassing the Milky Way. If WIMPs are the Dark Matter, then we should be able to detect their presence with teresstrial detectors when they scatter off regular nuclei. The difficulties are the very small detectable signatures (of the order of a few keV) and the rarity of the collisions (a few per year per kg of target mass). Many technologies are being developed to exploit the scintillation light, heat, and/or charge that is liberated following a recoil, but all experiments must necessarily have extremely low thresholds, be made from radiologically clean materials to suppress background rates, be located in deep underground sites to shield from cosmic rays, and be able to discriminate between Standard Model backgrounds and elusive WIMPs. Here at UCL we work on the leading experiments in the search for Dark Matter. These experiments use liquified noble gas targets, operated as two-phase time projection chambers. Such technology has rapidly accelerated the race for Dark Matter over recent years, with xenon detectors in particular dominating the field and emerging as the most promising detector technology for a first detection. The LUX detector, which contained 350 kg of ultra-pure liquid xenon, operated underground at the Sanford Underground Research Facility (SURF) in S. Dakota, USA, between 2013 and 2016. UCL made significant contributions to LUX particularly with development o pulse and signal selection, idenitification and classification algorithms, and WIMP detection efficiencies. Building on the progress with the technology to-date, LUX remains the most sensitive detector in the hunt for Dark Matter particles, having consistently demonstrated world-leading sensitivity since 2013. LUX's first results from 85 days were improved on in 2016 by a reanalysis of the first results, spin-dependent results, the final exposure of 332 days and the combined total exposure, reaching a minimum WIMP-nucleon spin-independent cross section of 1.1x10-46 cm2. LUX has pioneered novel calibration techniques that have allowed probing of lower mass WIMPs than ever before in liquid xenon, by studying the low-energy response of the detector. An injected tritiated methane source was used to calibrate LUX with tritium beta decays, which help to characterise the electron recoil background from radioactive sources in the detector materials and surrounding cavern rock. 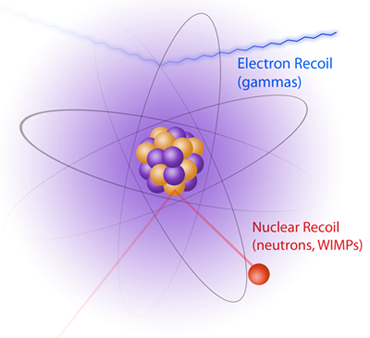 To improve understanding of the WIMP signal, mono-energetic neutrons formed in a deutrerium fusion reaction were fired into the xenon, causing low-energy nuclear recoils that mimic those of a WIMP interacting with a xenon nucleus. This technique allowed world-leading measurements of liquid xenon properties essential to expanding the dark matter search window. LUX was removed from its water tank in October 2016, but analysis of the data is ongoing, with a whole host of novel analyses investigating dark matter models in progress. 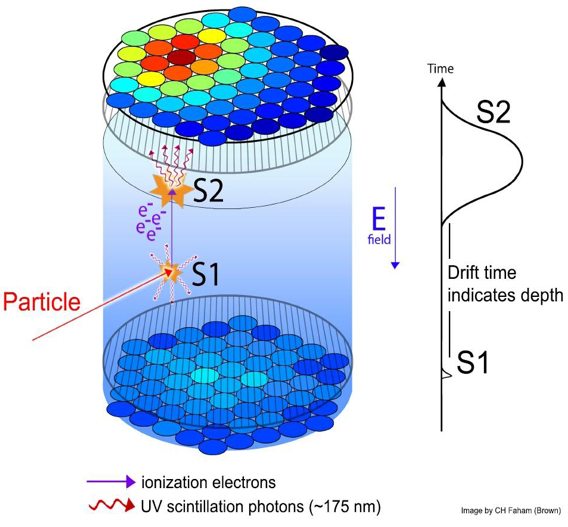 Noble gas time projection chambers use scintillation light (S1) and ionisation (S2) to identify particle interactions. Recording these two signals from any scatter allows the vertex position to be accurately reconstructed via the relative timing of the signals and the their distribution within the detector. Additionally, the ratio of the signals identifies the interacting particle - helping to reject non-WIMP background events and identify the Dark Matter. 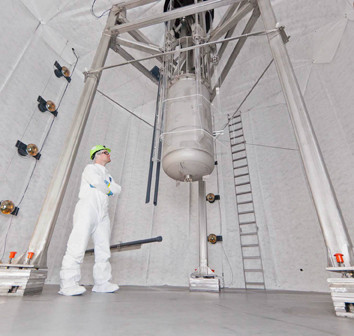 The LUX detector (shown above) uses liquid xenon as a target, as will LZ, building on technology that has proven remarkably successful. LUX-ZEPLIN (LZ) brings together the LUX project and ZEPLIN programme that pioneered the use of xenon time projection chamber technology through a series of xenon detectors at the Boulby Underground Laboratory. 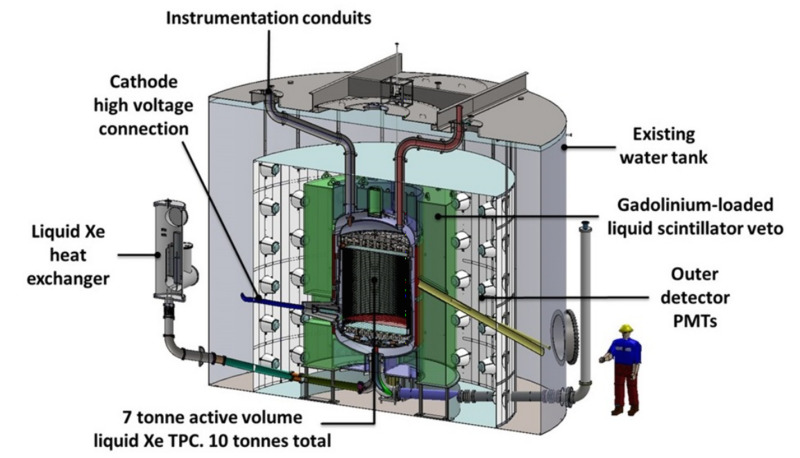 LZ will be a mammoth detector containing 10 tonnes of liquid xenon, with 7 tonnes in the active volume, and will deliver unparalleled search capability for Dark Matter. It will be housed using the same infrastructure as LUX at SURF, and will have the sensitivity to sweep virtually all the theoretically favoured parameter space for WIMPs. LZ is presently under construction and UCL hold co-responsibilty for the crucial Backgrounds and Screening Work Package, responsible for ensuring the experiment is constructed meeting it's low-background requirements for the detection of WIMP dark matter, and for construction of the high-precison Background Model against which any possible signal will be evaluated. We utilise cutting edge radio-purity assay facilities to screen all potential construction materials for trace amounts of radio-purities, with mass spectrometry at our dedicated ICP-MS laboratory at UCL, radon emanation measurements at MSSL, and gamma spectroscopy with the BUGS instruments at the Boulby Underground Laboratory. UCL also lead the project's Simulations Working Group (J. Dobson, convenor) responsible for Monte Carlo simulations to model the experiment. LZ will begin science operations in 2020. Overview of the LZ experiment showing the main components. LZ will be the most sensitive dark matter experiment ever constructed. For more information on the direct Dark Matter research at UCL, or for any matters related to the DMUK Consortium, contact Dr. Chamkaur Ghag (research team leader and Chair of the DMUK).